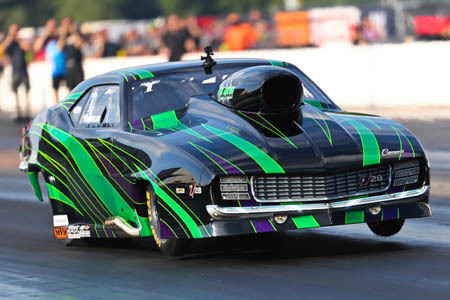 The upcoming start of the 2019 Professional Drag Racers Association (PDRA) season also means the start of the fourth annual PDRA Nitrous Wars competition. A season-long program recognizing Switzer Dynamics Pro Nitrous racers and their engine builders, Nitrous Wars will begin at the PDRA East Coast Nationals presented by FuelTech, April 4-6 at GALOT Motorsports Park in Benson, N.C.
"2019 will be a good year for Nitrous Wars," said Tyler Crossnoe, race director, PDRA. "It's a cool deal for the Pro Nitrous drivers to go after and create some rivalries between the drivers and between the engine builders as the season goes on. You've got Musi, Buck, Sonny's and all the other engine builders, then you add in the personalities like Jay Cox, Tommy Franklin and Lizzy Musi, and you can't ask for much better." Pro Nitrous racers earn a Nitrous Wars point for their engine builder whenever they qualify No. 1 at each of the PDRA's eight races. The No. 1 qualifier at the East Coast Nationals will also receive the PDRA Nitrous Wars nitrous bottle, a trophy continuously handed off to the next low qualifier as the season progresses. The trophy - and bragging rights - are ultimately awarded to the Nitrous Wars champion at the end of the season. Three-time Nitrous Wars champion Pat Musi Racing Engines leads the charge into this year's competition. Musi customers qualified No. 1 at six of the seven contested races in 2018, with points earned by Tommy Franklin (2), Jason Harris (1), Randy Weatherford (1), Lizzy Musi (1) and Danny Sauro (1). Perennial Pro Nitrous championship contender Jay Cox posted one point for Buck Racing Engines. "Besides Lizzy winning the Pro Nitrous championship, winning the Nitrous Wars means the most to me," Pat Musi said. "It really showcases the strength of Pat Musi Racing Engines, and the success of our customers. We don't plan on loosening our grip on that trophy anytime soon." Joining Musi and Buck in this year's Nitrous Wars will be Fulton Competition Race Engines, Sonny's Racing Engines, Reher-Morrison and Albert Racing Engines. Franklin, Harris, Weatherford, Musi and Cox are sure to be strong players again this season, while Pro Nitrous ET record holder Jim Halsey (Fulton) and the hard-charging Chris Rini (Buck) will add to the mix. Visit www.pdra660.com to keep up with the PDRA Nitrous Wars as the season progresses.